First Aberdeen this week launched a new Platinum on route 13 as part of a £1million investment in new vehicles. Service 13’s upgrade to ‘Platinum’status will see it feature the newest vehicles in First Aberdeen’s fleet, all with the same high specification those using Platinum elsewhere have come to expect. However as well as free wifi and a no-quibble guarantee, these vehicles will also be the first to feature USB charging points for customers to charge phones and tablets as they journey to and from the city centre. 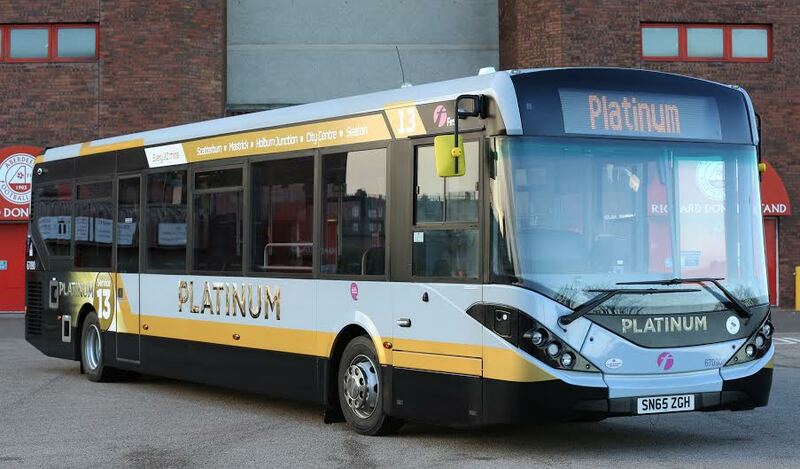 With a slick metallic new‘Platinum’ livery, Service 13 will no longer be known as the ‘Salmon line’ for the pink branded buses previously used. Operating from from Scatterburn to Seaton via Mastrick, Holburn Junction and City Centre at a 20 minute frequency. At the outset it was agreed that the aim of Platinum should be to deliver a bus service that was so customer focused that passengers felt as if they were receiving VIP treatment, which spectators travelling on match days can also now enjoy. Platinum also currently operates on First Aberdeen’s routes 12 and 19. Since launching in 2013, both services have achieved impressive levels of patronage growth while customer feedback has become incredibly positive. Platinum Service 12 has become one of the first services in the north east to feature ‘next stop screens’ and ‘next stop announcements’ providing an extra benefit to customers, especially new or infrequent bus users or passengers with sight or hearing issues. This will be replicated on Service 13. Managing Director of First Aberdeen, David Phillips said: “We believe Platinum is the bus service for the next generation. This is the third Platinum route to be rolled out in the city, and we expect it to attract even more people out of the car and onto the bus. “We’ve seen strong growth on our other two Platinum services since we launched the concept in 2013 and that’s in no small part down to the fact that they are the most customer-focused bus services in the country. “We’ve listened to what our customers want from their bus journey. Over half our fleet now has free wifi on board and these buses also feature USB charging points for the first time. ‘Next stop’ announcements and screens also provide assistance to passengers with sight and hearing issues and these feature on Service 12 and 13 now as standard. First Aberdeen employs more than 500 staff and operates over 175 buses from the King Street depot.